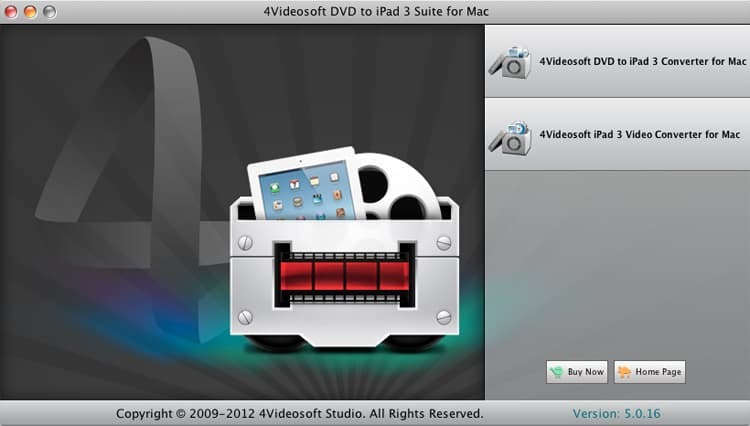 4Videosoft DVD to iPad 3 Suite for Mac is packed with DVD to iPad 3 Converter for Mac and iPad 3 Video Converter for Mac, which can convert DVD and any popular video file to iPad 3 supported MP4, WMV, MP3 ,etc. on Mac. With this professional Mac DVD/video to iPad 3 Converter, you can also edit the DVD/video effect for your need. The DVD to iPad 3 Converter for Mac enables you to convert any DVD file to iPad 3 on Mac with expected quality. iPad 3 Video Converter for Mac is also able to convert popular video files to iPad 3, such as MP4, HD, MTS, AVI, VOB, ect. The video brightness, saturation, contrast, volume and hue can be adjusted in order to get better output effect. By setting the exact start and end time, you can convert part of the source DVD or video, if you like. You are also allowed to crop the video play screen and merge DVD/video chapters together. Audio track and subtitle can be freely chosen by you for the output iPad 3 video. Since this DVD to iPad 3 Suite for Mac supports previewing, so you can catch your favorite pictures while previewing. By just a few of clicks you can finish the whole process of DVD or video converting, wo can see that 4Videosoft DVD to iPad 3 Suite for Mac is easy to use.